Northwest National Real Estate: New Listing! Horse Lover's Dream Facility! New Listing! Horse Lover's Dream Facility! Amazing horse set up, Idaho Falls, Idaho. 20,000 square feet heated indoor arena with water hydrants and treated sand for dust control. Eight box stalls with rubber horse mats and auto waterers. There is also, a 4,800 square feet exterior lean-to for feed. Tack room, wash room, and vet and horse grooming room. Property includes 63.59 acres with appx 5,600 feet of 4-rail vinyl fencing, and two metal and pole round corrals. There is also a 1,068 square foot 2 bedroom living area inside the facility with a window view of the entire indoor arena. Property is subdivided into 5 building lots with a gravity flow irrigation system. Professional appraisal five years ago for $1,250,000 when the market was down! This property is a horse lover’s dream. 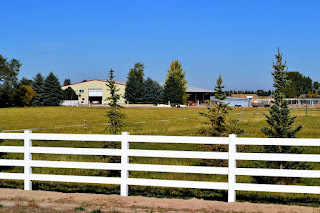 Contact Idaho 1st Class Properties at (208) 681-0929 for a private showing. Priced at $1,195,900.